The office building of the executive engineer of Nagaland public works department (roads and bridges) in Dimapur was sealed on Wednesday evening after the Dimapur principal district and session judge court passed an order to attach the land and office of the department located at PWD colony here. 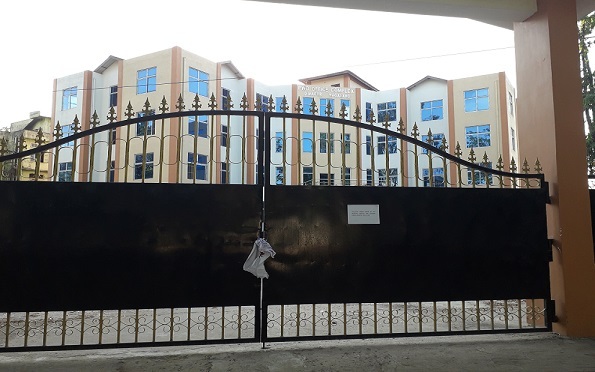 The Dimapur court issued the order on Wednesday for proclamation of sale of the attached property in order to pay a contractor out of the sale proceeds in pursuance of Zunheboto district court precept for attachment and sale of the land and office building of the PWD executive engineer in Dimapur for non-payment of outstanding dues by the department for a contract work executed by Alen Meren Enterprises in 2012. The property will be put up for sale, specified in the property schedule, through public auction, the court order said. The order said the sale would be held by an appointed officer of the court at the executive engineer’s officer at 11 am on November 20 in the absence of any order of postponement. According to reports, the Nagaland government awarded the contract work for construction of 30.00M Span RCC bridge over Lanki river on Satakha-Saptiqa Road in Zunheboto district at an approximate work value of Rs 522.95 lakh to Alen Meren Enterprises in 2012. An amount of Rs 125 lakh was released to the contractor during the execution of the work. The executive engineer of the department in Zunheboto issued a completion certificate after the contractor completed the construction of the bridge as per the specification in the year 2016. However, the department failed to release the pending bill despite the completion of the work following which contractor approached the Zunheboto district court for redress of his grievances. After a hearing, the court on February 14 this year passed an order directing the state government and its machinery to pay an outstanding bill of Rs 3,97,98,000 with interest of 7% plus the cost of the suit to the contractor. Despite the court order, the outstanding bill was not paid to the contractor by the state government and its machinery. The Zunheboto district court subsequently initiated execution proceeding in the case and attached the land and office building of the executive engineer, PWD (roads and bridges) of Zunheboto vide order dated September 25 for the proclamation of sale of the same in order to pay the contractor out of the sale proceeds. The Zunheboto district court later issued a precept to the Dimapur district court for attachment and sale of the land and office building of the PWD (roads and bridges) executive engineer in Dimapur as the sale of the property of executive engineer’s office of the department in Zunheboto would not satisfy the entire decretal amount of Rs 3,97,98,000 with interest at the ret of 7% and cost of the suit.